While you are remodeling the kitchen make sure you have plenty of counter space. The counter revolution of mini appliances is coming. Have you seen what's going on in coffee makers these days? Coffee makers are aware that the 10-12 cup coffee maker isn't appropriate for the modern commuter lifestyle. A battle is brewing(pun intended) and coffee companies and appliance makers are teaming up to go after the huge coffee market in the US. The formats seem similar. 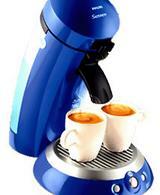 A counter top appliance accepts a coffee packet(pod) and dispenses one or two cups of coffee in just minutes. The speculation is that the real money is in the coffee pods. Multiple flavors and brews keep the consumer coming back for more. On the left is the HCC 100 from Black and Decker, part of the Home Cafe' line from Proctor & Gamble brands Foldger and Millstone. On the right is the Senseo system from Phillips. 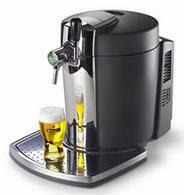 Already having sold 5 million machines in europe, Philips looks to sell 2 million per year in the US. Expect Phillips and Sara Lee to go head to head with Black and Decker and P&G. How long until a machine like this is simply built into a luxury car? Then Brand on Brand becomes Brand on Brand on Brand. 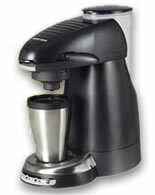 Imagine brewing a mug of Starbucks band coffee in the Phillips brand coffee maker in the dash of your Mercedes Benz car. Beverages are the new toast. Make way for the luxury beverage machine market to follow the curve mapped by the luxury toaster trend. Only ten times bigger. Starbucks is right in line with this one. I noticed their minipods for sale this a.m. when I was meeting a client for coffee. if only my tired and overworked body didn't require oh so much more than a cup!